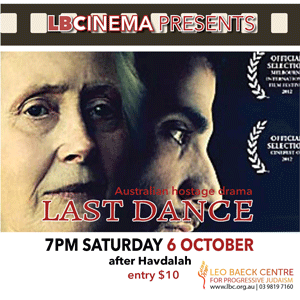 Come along to the October LBCinema showing of Last Dance, an Australian hostage drama that uses the Israel-Palestine question, Islamist terrorism, the Holocaust and notions of personal cowardice and forgiveness as its dramatic fuel. The plot centres on an elderly Jewish lady held hostage in her Melbourne flat by an injured terrorist on the run after a deadly bombing of a synagogue. Entry $10.